Elegant, 2.4mm wide rub-over set full diamond eternity ring, set with 0.50cts of round diamonds within full bezel settings. 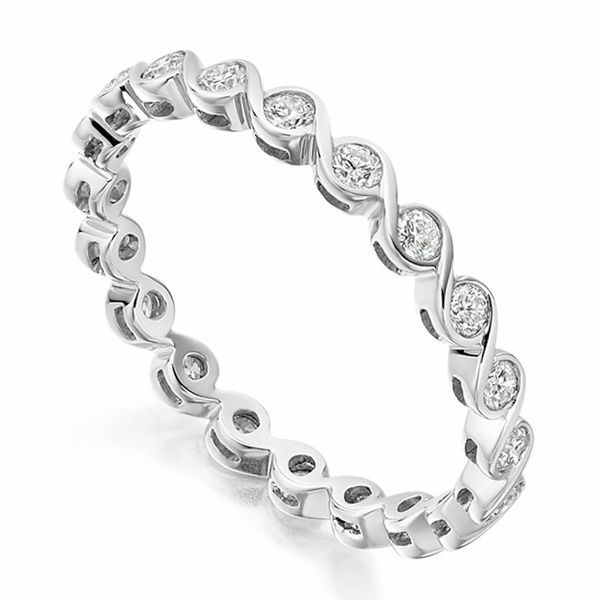 This elegant fully set Diamond Eternity Ring has a subtle but stunning feature of a rub over setting. Each setting gracefully flows into the next brilliant white Diamond. Each Round Brilliant cut Diamond is matched perfectly prior to setting in this flowing design, the Diamonds have been graded F Colour for brilliant whiteness and VS1 Clarity incredible purity. Available in a range of precious metals including 18ct White Gold, 18ct Yellow Gold, 18ct Rose Gold, 950 Platinum, 950 Palladium. Arrives at your door by secure courier in our luxurious bespoke packaging within 3-4 weeks.